Finally my computer problems are over. A little complicated, but solved. First was the computer, then the Internet provider took a while until reconnected me to the net. But enough with my complaints. I'm happy that I can read the blogs I love once again and I'm happy that I can blog again. Also this morning I had another great joy. 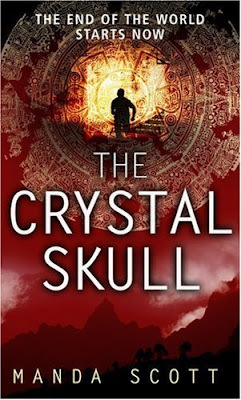 In my mailbox I found my first review copy, Manda Scott's "The Crystal Skull". Actually is the second, but the first was an e-book. Don't get me wrong, I appreciated the effort of John Joseph Adams and I really liked "Wastelands: Stories of the Apocalypse", but as I said in my presentation I prefer the classic books, because I don't like reading on the computer too much. So, I'm happy for my first classic review copy and I have to thank the nice people from Bantam Press for sending it to me. And I hope we will meet regulary once again, if my computer wouldn't go crazy once again :). The novel or the movie?